In the compiler literature, parsing algorithms for context-free grammars are presented using string rewriting systems or abstract machines such as pushdown automata. Unfortunately, the resulting descriptions can be baroque, and even a basic understanding of some parsing algorithms, such as Earley’s algorithm for general context-free grammars, can be elusive. In this paper, we present a graphical representation of context-free grammars called the Grammar Flow Graph (GFG) that permits parsing problems to be phrased as path problems in graphs; intuitively, the GFG plays the same role for context-free grammars that nondeterministic finite-state automata play for regular grammars. We show that the GFG permits an elementary treatment of Earley’s algorithm that is much easier to understand than previous descriptions of this algorithm. 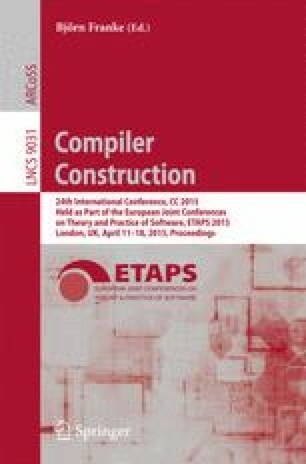 In addition, look-ahead computation can be expressed as a simple inter-procedural dataflow analysis problem, providing an unexpected link between front-end and back-end technologies in compilers. These results suggest that the GFG can be a new foundation for the study of context-free grammars.